The Online Home Of Randolph Lalonde: Spinward Fringe Broadcast 13 Cover! Spinward Fringe Broadcast 13 Cover! Spinward Fringe Broadcast 12: Invasion is almost finished, and editing is going well, so it's time to start talking about where that book will take us. I'm super happy to present Spinward Fringe Broadcast 13: Warriors. With a more consistent writing pace behind Spinward Fringe and a story direction with even more momentum, this promises to continue the impactful story telling that some of you have already seen in Broadcast 12. 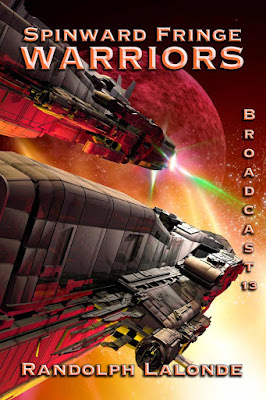 There will be a short break between Spinward Fringe Broadcast 12 and 13 on the Patreon site (A week or two at most), then Broadcast 13 will begin serializing there as Broadcast 12 lands on your Ebook readers. In the next couple weeks, you'll see the preorder date for Broadcast 13 pop up too, so keep your eyes peeled. I hope you like the cover and the name of the new book..